If you’ve never made monkey bread but admired it from afar, let me be the first to tell you, it’s as delicious as it looks. 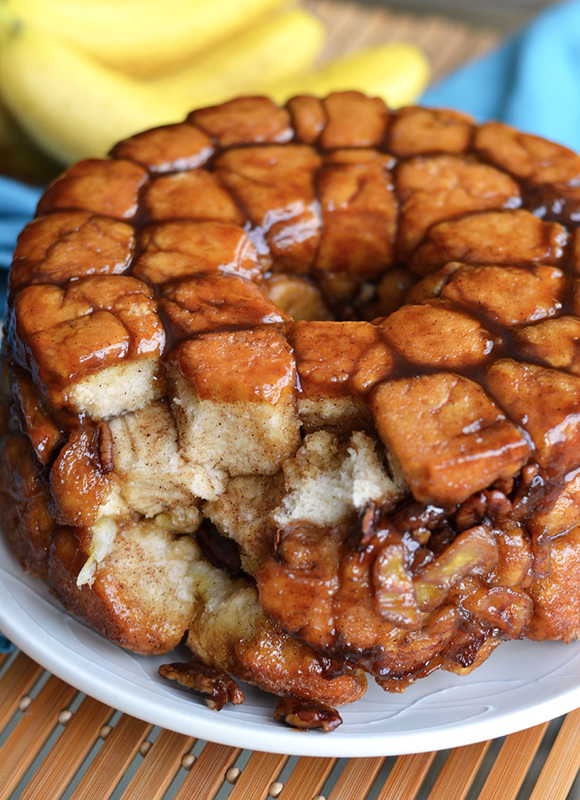 This was my first experience with monkey bread and I couldn’t be happier with the results. Maybe I should have stuck with original and skipped the bananas, but what’s the fun in that? The bananas make it like a gooey caramel banana bread. But better. The doughy nuggets are easier to eat than a regular caramel roll and you feel like you’re not eating such a large portion (good luck stopping at just a few pieces though). Monkey bread may not be an American classic as of yet but it’s quickly becoming one of my favorites. Surprisingly, I managed to squeeze a little classic cooking into this indulgent sweet breakfast bread. The base of this recipe is a basic Parker house roll recipe from “The Taste of Country Cooking” by Edna Lewis. I’m new to Lewis’s delightful Southern cooking but have enjoyed the few recipes I’ve tried so far. Her rise to cooking fame came shortly after my grandmother’s, making her part of what I consider a classic American foodies group. Paging through the recipes in her cookbook feels like taking a relaxing summertime vacation, complete with a glass of sweet tea. This basic parker house roll recipe lends itself so well to banana caramel monkey bread, I can’t imagine making it any other way. The buttery caramel layered with sweet bananas and pecans, is irresistible. This recipe may look large but you will be surprised how quickly the doughy deliciousness disappears. Serve warm with coffee or tea for a sweet start to your day. Or serve as an after dinner treat and your day will be complete. Note: If you don’t have time to make the dough from scratch, store-bought/packaged biscuit rolls maybe used a substitute. Dissolve the yeast in the ¼ cup lukewarm water with sugar. Place butter and salt in a large mixing bowl. Heat the milk to almost boiling and pour into the bowl containing the butter mixture. Stir until all is dissolved. When lukewarm, add the flour and stir. When halfway mixed, add the dissolved yeast. Mix well, knead the dough for about 5-8 minutes until soft and springy. Place in a buttered or oiled bowl and cover. Place bowl in a warm area and allow the dough to rise until doubled in bulk. Chop the banana. Grease a 10-inch tube, bundt, or Angel Food Cake pan. Preheat oven to 350 degrees. Punch down dough. Pull off pieces of dough and roll into balls about 1-inch in diameter. Place in a bowl or sheet pan. Melt ¼ cup butter. Brush or drizzle butter over dough balls and toss to coat. Roll each dough ball in cinnamon sugar. Place in the cake/tube pan in three layers of dough balls, sprinkling half the banana and pecans (if using) between layers. Combine remaining ½ cup butter, brown sugar, and remaining banana in a small saucepan over medium-low heat. Heat until combined and sugar begins to dissolve. Pour over dough. Place the cake pan on a baking sheet and bake 30-35 minutes until brown and bubbly. Serve warm. Note: Cinnamon sugar can be made by combining one 1 tablespoon of cinnamon with 1 cup granulated sugar.